Public Health is … Dark Green Leafy Vegetables! As a child, vegetables were seen as an item that should be pawned off to the dog rather than consumed. Yet, we were constantly told to eat more of them but rarely were told why, aside from “they are good for you”. Even as adults there are still a few vegetables that we steer away from or cringe at the sheer name of, such as kale or chicory. Unbeknownst to many, these are two of many veggies categorized as dark green leafy vegetables, which provide unbelievable health benefits. 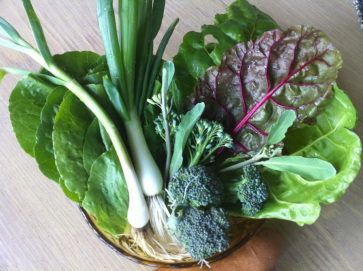 Dark green leafy veggies are great sources of fiber, folate, and a wide range of carotenoids. Some research has found that the carotenoids found specifically in dark green leafy veggies have the ability to inhibit the growth of certain types of breast cancer, skin cancer, lung cancer, and stomach cancer cells. Despite health benefits, we simply are not consuming sufficient vegetables and certainly not enough dark green ones. Experts recommend eating between three to six cups of fruits and veggies a day but only one in ten adults are consuming the recommended serving. This may seem like a very large quantity, but given the incredible health benefits of the dark green leafy varietal, it might be worth adding them into your daily diet. It is easier (and tastier) than you think! Try replacing potato chips with kale chips, add a handful or two of spinach to your smoothie, or just make a good old fashion romaine salad. We have provided a few recipes below that even our littlest readers will enjoy! 2. Place kale on baking sheet. Spray or drizzle with olive oil and sprinkle with salt. 3. Bake for about 10 minutes or until edges brown but they are not burnt. Keep a careful watch here as they can burn quickly! Great blog guys! And great recipe: I just made kale chips for dinner last night, actually! They are always a big hit here where I live and go fast. Great post and I love the kale chip recipe. They’re surprisingly good! Sounds delicious, I can’t wait to try the recipe! Now, if I can just find someone else to make them…I love the idea of including recipes. Great job! thanks for a great blog post, kale is one of most favorite things in the world, and I find endless delicious ways to eat it, like right now i am eating a great raw kale salad (massaged..- here is a one link on how to massage your kale into a yummy salad – you can put all sorts of other veggies in as well, goat cheese, nuts, even fruits or tofu or chicken. I’ll try some kale chips soon! I just had an acai bowl on Sunday with kale & spinach mixed with (masked by) pure acai, berries, banana, nutmilk and agave blended together on top of hempseed granola topped with bananas and berries. YUM! I’m glad everyone is enjoying the Kale chips recipe! Kale is one of my new favorite foods. If you like the crunchier version I would also recommend Kale Crunch which I know you can get at Whole Foods and I also bought a container of it from a local organization (Mighty Mouth Foods http://www.facebook.com/pages/Mighty-Mouth-Foods/149157505118102) this weekend at a Farmers Market! Just another way to get some green veggies in your diet! Well written article and a great reminder on simple tips to improve our daily nutritional intake of leafy vegetables! thanks for the tip and I will be trying the kale chips soon! This is great! I just started drinking green smoothies and I love them! I’m going to have to try the kale chips recipe too. I always try to eat more leafy greens, but have trouble finding places to inject them in meals. I’ll for sure make the Kale Chips and try out the smoothie as well, thanks for the recipes! Thanks Liz! Emily made these the other day with some red pepper flakes and they were yummy! Can’t wait to attempt myself. It’s nice when people are not selfish and want to share their work with others. Thank you! I’m glad I found this page. Thank for info provided here.